Providing patients with effective, state-of-the-art chiropractic that gets excellent results is what drives us. 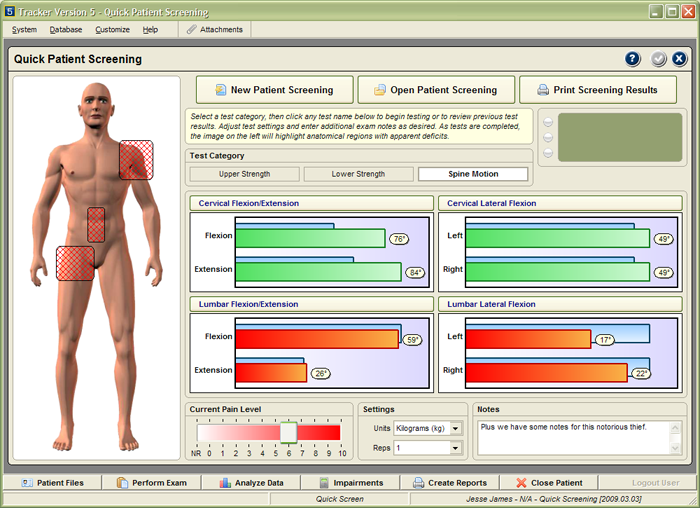 We are pleased to now be able to offer patients a screening tool that measures range of motion (ROM) in real time. In simple terms, ROM is how far you’re able to move your joints in different directions. Testing ROM is essential as we need to know how severe your injury is. To measure ROM, we use JTECH inclinometers which are wireless and lightweight. Testing is fast, reliable and painless. It is also recommended by the AMA as their preferred method for capturing compound spinal range of motion data. At the completion of the test, the image on the left of the screen will highlight the anatomical regions that have evident deficits. The tool is fast, creating a report in mere seconds. You will be given the report to take home. Because you’re busy, this tool is another way we value your time. Based on the results, we can create a customized care plan to improve your range of motion and address any other problems you’re presenting with. Would you like to test the Quick Screen module? If yes, contact Becker Chiropractic and Acupuncture today to book an appointment!